Columbia, MO Hotel's Location Delights Mizzou FansWhen driving into Columbia, end your journey at the Holiday Inn Columbia - East hotel and enter a world of warm hospitality and incredible convenience. Situated off I-70, only six miles from the University of Missouri and the unique downtown area known as The District, this hotel is an inviting home away from home in Columbia.The hotel's corporate guests can work efficiently thanks to free wired and wireless Internet access and the 24-hour Business Center. Major corporations, such as Shelter Insurance, State Farm, Kraft Foods, IBM and ABC Laboratories, are all within 10 miles of the hotel, making travel a breeze. If you need to host your own event, you can use one of the hotel's three meeting rooms.In Columbia, MO, exciting urban fun abounds! You can hear fabulous live music at The Blue Note, splurge at The Mall in Columbia or sip wine at the gorgeous Les Bourgeois Vineyards. For outdoor fun, show off your swing at Lake of the Woods Golf Course, just one mile from the hotel's location. Columbia, Missouri also hosts enjoyable annual events, such as the Show-Me State Games and the Roots 'N Blues 'N BBQ Festival.After a busy day, return to the hotel to relax in the heated, indoor pool and whirlpool or work out in the 24-hour Fitness Center before indulging in a delicious meal at Kem's Restaurant. 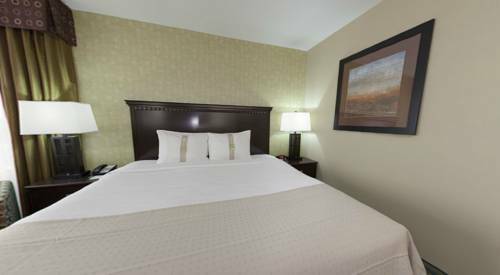 Book now to enjoy this inviting hotel's excellent location in Columbia, Missouri. T.G.I. FRiDAY S: TGI FRIDAYS strives to offer casual dining with an emphasis on FUN! To that end, the restaurants feature delicious food, original drinks, and unique flair on the walls for everyone to enjoy. China Garden: A large Chinese buffet with dine in and carry out. They have one of the largest selections of Chinese buffets in town and a small Hibachi grill! Bob Evans Restaurant: High quality food and excellent hospitality. Good american cuisine at a fair price! Golden Corral Family Steak House: Home style buffet that is good any time of the day. With so many choices even the pickiest eaters will find something to enjoy! El Jimador: Mexican food prepared fresh. They have many different menu items to choose from at this family owned restaurant. Try the white cheese sauce and finish up your meal with some delicious fried ice cream! Kem's Restaurant and Lounge: While enjoying the hotel make sure to stop by Kem's Lounge, located right off the main lobby. We offer daily drink specials and a wide array of your favorite liquor, beer and wine. Try out our new menu and sample a Moscow Mule or a Lynchburg Lemonade! Columbia Missouri Room A: Meeting room is elegantly appointed with drop-down screen, sink, telephone and wireless internet service. Columbia Missouri Meeting Room B: Elegantly appointed meeting space including, sink, drop-down screen, and wireless internet access. This room is perfect for a small gathering. Columbia Missouri Meeting Room C: Elegantly appointed meeting space with drop-down screen and high speed internet access. Lake of the Woods Golf CourseThe 18-hole "Lake of the Woods" course in Columbia, Missouri features 6,149 yards of golf from the longest tees for a par of 71 . The course rating is 68.4 and it has a slope rating of 119. Lake of the Woods golf course opened in 1970. Downtown Columbia The DistrictThe District, Columbia s eclectic mix of restaurants, shops, art galleries, music venues, sporting events, and coffee houses. Cosmo Park, Rainbow Softball ComplexCosmo Park has a wonderful playground for kids of all ages, a skate park, soccer, football, and softball fields. Shelters for picknicks or parties are also available. University of Missouri CampusThe University of Missouri's beautiful Columbia campus. Home of the Mizzou Tigers! Come check out the beautiful architecture which really puts Mizzou on the map. Faurot Field-Memorial StadiumHome to the University of Missouri Tigers!! Hearnes Center, Mizzou ArenaThe Hearnes center is a 13,611 seat mulitpurpose arena which is currently home to the MU Tigers wrestling, gymnastics, and volleyball. The Hearnes is also home to many High School events. Columbia College, Stephens CollegeStephens College was established in 1833 as a womens performing and liberal art college. It is the oldest college in Columbia. Columbia College was established in 1851 as a private nonprofit co-educational liberal arts and sciences college. Bass ProFor all your Sporting Good needs. Fishing, hunting, boating and camping! Midway Expo CenterQuality antique furniture, jewelry, coins and collectables. Columbia MallColumbia Mall offers Columbias top shopping experience. Hollywood Cinema 14Hollywood theatre is the biggest theatre in Columbia. Featuring 3-D movies and a kid friendly arcade. Shelter Insurance Gardens Concert SeriesShelter Gardens features an impressive variety of flowers, shrubs, and trees. In June and July you can enjoy the concert in the park. Bring a chair or blanket and enjoy the atmosphere. Missouri Art GalleryThe mission on the Columbia art league is to provide the community with a stimulating environment for experiencing the visual arts through exhibitions, education, appreciation, promotion, and creation of art. Rocheport Winery- RocheportLes Bourgeois is located on 15 acres of blufftop property above the Missouri River. They offer catering and private events, a blufftop bistro and a tasting room and gift shop. Isle of Capri Casino - BoonvilleThe casino boasts exciting slots and table games, delicious dining, comfortable rooms and much more.